Oct. 18, 2012, 10:47 a.m.
By Joshua Benton @jbenton Oct. 18, 2012, 10:47 a.m.
Every business, at some point, faces competition. But competition is not the same as disruptive competition — a new class of competitors created when technology enables new players to compete with incumbents on terms the incumbent isn’t used to. It’s Japanese car companies going small in the face of Detroit’s gas-guzzlers; it’s steel mini-mills competing with giant, integrated steel companies. And it’s all the digital forces that have faced the newspaper business — from blogs to aggregators to social media and more. In each case, incumbents initially judged the new competition to be low in quality — and they weren’t wrong! But what happens in times of disruption is that traditional metrics of quality get challenged, and values like speed, low cost, and efficiency are valorized. Those low-end competitors start making money — and then they move upmarket. Toyota starts making Lexuses; The Huffington Post starts winning Pulitzers. 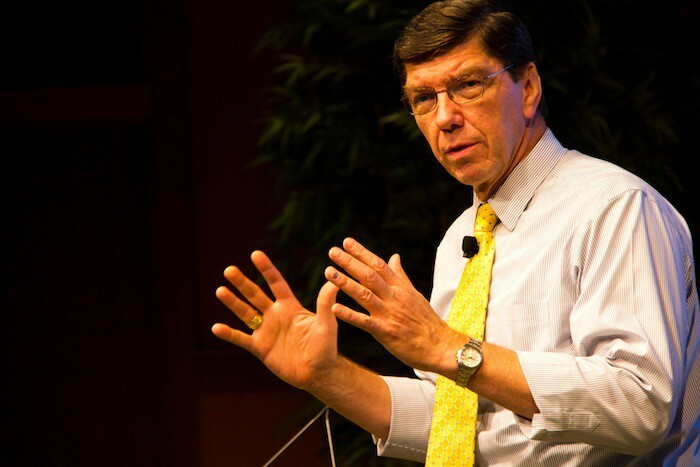 Some version of that basic story has happened in many industries, and what we think about it is based mostly on the work of Clayton Christensen, the Harvard Business School professor and author of books like The Innovator’s Dilemma and The Innovator’s Solution. But two ideas in Clay’s work have always stood out for me. First, focus on the jobs that your customers are hiring you to do — and on new ones that you might be in a good position to do. Successful companies often value elements of their products that audiences don’t particularly care about; getting too much distance between those two perceptions leads to business failure. And second, create a separate business focused on taking advantage of the disruption that’s challenging you — and give it permission to outcompete and outperform its parent, even to run it out of business. Disrupt yourself before someone else disrupts you. Last week, I had the chance to speak with Clay, David, and James about their piece and how news organizations’ business models should be responding to disruption. The audio of our conversation’s above; a transcript’s below. I know the three authors would be happy to hear your feedback on Twitter (@claychristensen, @dskok, @jamesallworth). Joshua Benton: A few years ago, you were involved in the Newspaper Next project, that required looking at disruption in the news business at an earlier stage, and prescribed a number of ideas for the newspaper industry in particular. [See our look back at Newspaper Next from last year. —Josh] I’m curious, now that it’s been about five years or so — six years or so, now, I guess — looking back on it, how do you think the scene has evolved in the time since you were first looking at this, a half decade ago, when the disruption that the Internet had provided to the industry wasn’t quite as advanced? Even the newspaper business is in a growth industry…It’s just their way of thinking about the industry that is in decline. Clay Christensen: Yeah, well, I’m proud but also sad to say that pretty much everything that we foresaw is happening. I think we didn’t quite understand, and still don’t really understand, how quickly things fall off the cliff. I think the reason why this happens is that, even as the disruption is getting more and more steam in the marketplace, the core business persists, and really quite profitable for a very long time. Then, when the disruption gets good enough to address the needs of your customers, very quickly, all of a sudden, you go off the cliff. Like for the Harvard Business School — we’ve been saying for about 13 years now that management education is going to be disrupted by in-house corporate universities. And nobody just ever imagined that it would happen. In fact, every metric of goodness at the Harvard Business School has been improving and still continues to improve — even as last year the number of people applying to Harvard MBA programs dropped off 22 percent. In the prior year, it went down 11 percent. I really believe that the business schools are just going off the cliff. You don’t feel it until right at the very end. I think that is what is happening with the newspapers. The business kept going at a plausible level for some time. I think you are seeing a nonlinear decay in the core business. Benton: And that’s interesting, because, as you’ve described in your books and elsewhere, it really locks into people’s conceptions of what “quality” really is. Detroit thought that their cars were increasing quality and were not ready to be disrupted by Japanese automakers. And it’s the same story in journalism. The perception of the incoming disruptors is that they are low quality, and therefore not really worth paying attention to. I wonder, Clay, how you think that your model applies to fields like journalism, where a lot of the people involved in it feel very mission-driven? Journalists don’t necessarily go into the field thinking their goal is to maximize profits — even though that may be the case, from a business perspective. If history is our guide…the platforms do gain an edge. Christensen: That, also, is a great question. I guess, a couple of thoughts on that. The first one is, although journalists, many of them really are mission-driven, they’re not the only people who have driven them into their professions. Physicians, many of them, are mission-driven. What happens in their case is that technology allows nurses to provide more and more high quality care. The instinct of the physicians is to look down their noses at the nurses, and say, “They’re not as good as we are.” And they feel like their mission is compromised by handing off care to “less quality” care providers. And teachers feel the same way. So it’s not unique, but I think in each case, the reaction of the leaders in the industry is to justify the need why they shouldn’t change, and everybody else is wrong. And you keep changing the definition of quality to justify why you don’t need to be worried. I think that that’s probably what’s going on. Benton: Yeah. David, in putting together this paper, you spent a lot of time looking at the strengths and weaknesses of traditional news organizations, in an attempt to try and figure out what the jobs are that they might be able to do better. What were some of the things that you took away from that examination, as things that you think could be important strengths for news organizations going forward as they try to navigate this? There will be quality journalism that survives, and even thrives, once we move past this period. David Skok: Well, I think the one piece that really strikes me about how news organizations market themselves, and send their product to market, really comes down to this theory of Clay’s that’s just so brilliantly simple, yet explains so much, which is called “jobs to be done” and that we outline in the paper. What that argues is that it isn’t the way that the demographics — or that I’m a 33-year-old journalist from Toronto, and so you need to market your paper or your product towards me that way. It’s that I’m actually just trying to fulfill a job in my life — and so can your product fulfill that job for me? It’s so elegantly simple — but in some of the research and looking at a lot of the publications and media organizations that are out there, you don’t necessarily see them doing that. Where that’s the job — new technologies come out which enable you to do that job better. News organizations haven’t necessarily adapted well to how those new technologies can do that job better for them. Benton: Right. It’s competing with Angry Birds and all the rest. James, one of the things that comes across in the paper is, when you’re looking at jobs to be done, a lot of them involve speed, and summarization, and filling in small windows of time within someone’s day — particularly on mobile devices. I’m curious what you think the role of that new shift towards shorter, faster, more summarized — what kind of implications that has for journalism and for news organizations? James Allworth: Josh, I’m not sure that that actually is a new job. It’s one that we chose to focus on in the paper because it’s one that I think people readily understand, because they have that job in their own lives. But if you go all the way back to the foundation of Time magazine, I think it was way back in the 1920s — it was founded by the coeditors of the Yale Daily News. They decided to create Time as an aggregator because they thought that there were too many newspapers in New York, and people just didn’t have time to get through it all. And that’s how one of the most popular publications of the 20th century got its start. So I don’t necessarily think that this is a new job or a more recent phenomenon. I think that there are technologies that have emerged that are able to better enable people to complete the job. “I’ve got 10 minutes of my time. Tell me what’s happening in the world.” Or “Give me the news that relates to me.” But I don’t fundamentally think that the job has shifted over time. Benton: I do think there’s one thing that that aggregation job does — particularly under current copyright laws — is favor platforms, as opposed to someone who creates the news and is at that stage of the value chain. Someone who assembles it in a way that makes sense for rapid consumption, or any other kind of consumption. Do you think that, if we look back on this in a few more years, we’re going to see decreasing power and strength of news creators, and increasing power of news platforms and aggregators? Allworth: Well, I don’t know. If history is our guide — and I think it’s a reasonably reliable one when you look at it through the lens of these theories — the platforms do gain an edge. But if there’s too much of an erosion in terms of the creation of quality journalism, then what will tend to happen is that the platforms will actually have to step up, themselves, and make sure that that quality news is being provided. History does tend to repeat, and the HuffPo journalist that just won the very prestigious journalism award — it just strikes me as history repeating. These guys come in at the low end, and people initially scoff at it. They say, “This isn’t good enough, compared to this high quality product that we have” — but they create a business model that works well for the technology, and then they move upmarket and they get better. I’m personally bullish about quality journalism going forward. It’s just a question of whether some of these institutions that a lot of us are very fond of, whether they’re able to make the transition as well. I’m hopeful that they will be able to. Christensen: Can I just interrupt, one thing? Christensen: To all of us, there is a really interesting piece of ongoing work to do that has emerged from the election for presidency in America. As a result of a polling exercise, it looks like Mitt Romney is losing by about 20 percent amongst voters who are women aged 35 to 55. Everybody starts to make the gears in their heads go: “Well, how does Romney get a larger portion of the vote from voters 35 to 55?” Well, if you think that what causes people to vote or buy something is the characteristics that they have in common — what they’re doing is the very sin that the jobs-to-be-done theory is trying to absolve. If you think that the market is created by these demographic segments, the way to get more of the votes from women aged 35 to 55 is to offer all of them everything, because they have nothing in common other than that particular demographic characteristic. And so you do that, demographic by demographic. And the only way that you can ever win, if you think that’s the way the market is structured, is to keep offering everything to everybody, which then causes you to lie, which then causes you to pick apart your opponent. Every election — it just is an awful experience for everybody. I wondered how interesting it would be to organize a campaign around “there are different jobs to be done out there, amongst the voters.” What would happen to the election if the combatants understand the theory of jobs to be done? The reason I say that is, (a) it’s just interesting to us, as we are trying to understand it, but (b) we see most newspapers doing the very same thing, thinking about how they can arrest the decline of membership amongst the younger people and professional people and so on. Benton: That’s interesting. It reminds me a bit of Jay Hamilton at Duke and his theory of the four types of information: producer information, consumer information, entertainment information, and civic or voter information. [It’s actually Anthony Downs’ theory, cited by Jay in his book All the News That’s Fit to Sell.] His argument is that voter information — the kind of information that makes you a smarter and more informed voter — is the only one that doesn’t provide any return on your investment, because you are very unlikely to be the one person who decides an election. Chances are you’re not going to get anything out of it. It would be interesting to think how that ties into jobs to be done. But let me ask you — I wanted to play off what you were saying before, Clay. I have read many of your stories over the years of various industries reacting to these sorts of disruptions. And for the most part, they are not happy stories for the incumbent. I’m curious, to provide a little bit of inspiration — is there an industry or two that stands out in your mind as one that has reacted — where the incumbents have reacted very well to this sort of a technological disruption, who figured out what to do and really executed on it? Christensen: Well, if I stay inside the newspaper industry, The Washington Post has done I think a fantastic job. Their [COO], Alan Spoon, in the late ’90s, actually read The Innovator’s Dilemma, unbeknownst to me and just, all on his own, started to assemble a set of companies that were in the business of online learning and teaching. For 15 years, those just performed incredibly well. The idea is that teaching is what they are trying to do. You can teach through newspapers. But you can also teach through online learning for professionals who need refreshment. Really, for those guys, the decline in The Washington Post per se doesn’t faze them at all. They have the resources to do a lot of good things. They’ve done that well. There were 316 traditional department stores in America in 1960, just as they were getting disrupted by discount department stores. Of the 316, one of them, Dayton Hudson, survived very well. They set up a completely different business unit called Target and just drove that to great success. The other 315 department stores have now consolidated down to just eight of them remaining. So there are a few. But I think we would all say that it’s frustrating that, even though managers who realize that disruption is occurring — even though they know it’s happening — they don’t do it, because the data becomes clear after the game is over. They really have to act on the basis of theory, which I think a lot of people find hard to do. Benton: Right. James, let me ask you about — playing off on that and Clay’s mention of the Post — one of the questions on how to respond to this sort of disruption is how to structure your response. In newspapers and news organizations, part of that has been how close to or separate to keep the web operation and the print operation. Do you want them to be working side-by-side and under one common structure, or do you want them to be completely apart — as The Washington Post famously did, putting their web people across the river in Virginia while the newsroom was in Washington, D.C. From what you have seen in other industries and in the news organization business, what works — keeping them together or keeping them apart? Allworth: Clay’s research is pretty clear on this. If you are going to create a new business unit to respond to a disruptive threat, then it really needs to be kept at arm’s length from the host or the incumbent part of the organization. The problem is, if you keep them together, all kinds of the historical parts of the organization start to seep into the new disruptive business unit, which can stop it from getting off the ground in the first place, or potentially, if it does start to gain traction, the original part of the organization can start to see it as a competitive threat. You can have politics play within the organization to try and shut down the new disruptive business unit. The research would suggest — and the Target example is a great one. It was completely separate, developed its own business model, off you go, you respond to the threat. The research would suggest that you need to keep them separate. Benton: That’s interesting, because I think in the news case, there’s a unique or, maybe not unique, but an interesting complication, in that websites for newspapers were simply republishing a lot of the work that was produced by the print operation. They didn’t have the content base on their own — they weren’t a free-standing unit in the way that Target could be a free-standing unit. It seems, whether it’s a good idea or not, many news organizations that used to have this intense separation have since brought everyone back into the fold — because they’re all running out of money and they can’t afford to have two structures. Allworth: Right. If you can’t afford to have two structures, taking the web structure and folding that back into the traditional business unit, which has got a cost structure designed to run in a completely different world — that’s not the way to solve the problem. The way to solve the problem is to create a new disruptive business unit that’s got to work out how to become profitable by itself. The difference being: Don’t assume your starting point is the existing organization, and you try and cut, cut, cut, cut, cut until you make it down to a new organization. You think about it from a completely clean slate, and you say, “Okay, what do we need to add to create something that’s going to be able to compete with the Huffington Post?” That difference in perspective is critical in responding to disruptive threats. Benton: Yeah. Let me ask you something else, James, that came off of something you said earlier. You said that you were confident in the future of quality journalism. Let me just play devil’s advocate for a minute. I certainly understand — and I think the theory makes a lot of sense — about disrupters starting at the low end and moving their way up the value chain. That makes a lot of sense. But part of what we were talking about earlier is that quality is being redefined. On one level, it’s not as if Japanese auto makers started putting lots of chrome on big tail fins on their cars at a certain point. They moved up in a different way. The value they created while moving up was different than what the old model had done. Are you convinced that — the BuzzFeeds and the Huffington Posts of the world are certainly going to move up that chain, but are you convinced that they’re going to move up the chain in a way that performs the same functions, and has the same public-good benefits that old journalistic models did? Allworth: I believe so. Again, it seems like an opinion when you just argue whether it’s going to be HuffPo or whatever, whether they’re going to get to the point — but let’s go back to Time. It started off as an aggregator, too much news to read. They started — it was kind of a cheeky publication. But as it moved upmarket, it became — in the ’80s I heard it described as a publication that was able to pick Presidents. It had a readership of four million, circulation of 20 million plus. It’s a storied journalistic organization. I see no reason why these new journalistic organizations that are springing up on the web won’t be able to do exactly the same thing. Benton: Okay. David, you’re a working journalist in a news organization, and I think one reaction that some journalists might have, in reading the paper is: “This is very interesting and compelling, but I’m not the publisher of my news organization. I’m not a CEO. I’m a journalist.” Are there lessons that you think someone who works in a larger news organization — who is not on the product side, on the business side — can take from this paper and from Clay’s work, on how they could do something right now in their newsrooms? Skok: Absolutely. These theories provide a framework. The way that Clay and James put is always: You get a lens. It gives you a lens in which to look at where you are. And it may not necessarily be at the head of an industry, head of a government, head of a company, or even head of your own household. It’s really, at all of these facets of life — these theories can provide you with the lens that you need to get on with your day. There’s no question that the culture model that we talked about, for example, can affect you and show how you may be able to change the culture within your own newsroom, even in your own way, every single day. We all have tasks that we do during our day, and what this theory highlights is that every task you make, or every task or action you take during your day — it has much wider consequences. And if there’s nobody there to monitor those tasks and try to change them where they need to be changed, you’re not going to be able to embrace or address the disruption taking place in your industry. So, yeah, these theories are relevant for a working journalist or reporter on the front lines as much as they are for a publisher. And let me just say, I think what James said is exactly right, in terms of how we all came out of this. I did come out of it with this sense of optimism as well, that the disruption theory and the way that these organizations can move upmarket really does provide an optimistic tone to a lot of the things that are happening in journalism today, that there will be quality journalism that survives, and even thrives, once we move past this period. And I also would say, and we didn’t put this in the piece, but we focused a lot on BuzzFeed and the Huffington Post because they’re such perfect examples. But you even see the same thing happening with nontraditional journalism actors. Even Twitter or Flipboard are starting to create original content, or spaces for original content. The theory would argue that those players will move upmarket as well, and will be able to provide new forms of journalism that we may not know exist yet. Benton: David, you work in broadcast, which is a field that has not been disrupted to its core in quite the same way that newspapers have — at least not yet. I’m curious how you see the theories that you’ve spent a lot of time looking into playing out in the broadcast field. Skok: I would say that broadcast is just about — let’s go with 10 years behind where print was. The disruption — we’re really more in the “innovator’s dilemma” portion of the disruption, where there are a lot of profits still coming in from cable providers, specialty fees, subscriber fees, and advertisers on the television side. But make no mistake: A recent Pew report showed that the Internet and mobile is now the second largest way that people consume information, and that television is slowly declining. So the disruption is happening. But we’re almost in a point now where we have the benefit in broadcast of looking at what happened in print and using that as a great case study to say we need to look downmarket now, and recognize that if we don’t embrace our own disruption right now, that’s where we’ll be in 10 years. Benton: Yeah. Let me close with going back to Clay and asking something based on that. Broadcast is at an earlier stage in the disruption than newspapers are, but that makes me want to as: Is it too late for newspaper companies and for newspapers? As we said earlier they’ve already lost, depending on the paper, 40 to 60 percent of their advertising revenue. It seems highly unlikely any of that is going to be coming back any time soon. They haven’t had significant digital gains. They’ve laid off a lot of their people. The decline is pretty clear and obvious, and ongoing. Obviously, it would have been better if everyone took your advice five years ago, Clay, but what’s the appropriate response for an industry at this stage of being disrupted, where they’re quite a ways down the road already? Christensen: That’s, again, a great question. There’s a good case study on that one. This is Bonneville Communications and the Deseret News in Salt Lake City. They brought in a new CEO, whose name is Clark Gilbert who, as my doctoral student, studied the future of the newspaper industry, and he was a key player in the Newspaper Next project. He was on our faculty. He went out there, and in his mind is two things. The first one is that, indeed, the newspaper is getting disrupted — but it doesn’t disappear overnight. In fact, what you want to do with that core business is, you need to make it healthy. What that means is, you really do need to downsize it to the point where it can stand on its own. I believe the newspaper had, in Salt Lake City, roughly 100 employees, and he cut it in half. It was just brutal. And he talked about how hard it was for him just to walk on the sidewalks in downtown Salt Lake City, because people thought of him as so profit-driven. They started other businesses on the web that are all focused on jobs to be done — and so now the number of people employed by the enterprise is about 400, because when you look at the world from a jobs-to-be-done perspective, you see things that you otherwise just don’t see. A great example is their insight that there is a big — when you have people in an ethnic group who go around the world, you call them a diaspora. Every hometown has a diaspora that are elsewhere, who still have left a good portion of their heart in the community where they were raised. There is a job to be done there: “How do I keep in touch with those people that raised me?” That is just one of the things that they have done. I think, as a general rule, most of us are in markets that are booming. They are not in decline. Even the newspaper business is in a growth industry. It’s not in decline. It’s just their way of thinking about the industry that is in decline. And if they are thoughtful about whether there are jobs out there that we could address, as a general rule, most of us are awash in opportunities. Benton: Yeah, I’ve always thought it was a bit interesting that the two newspaper firms in the United States that are religiously affiliated, Bonneville and the Christian Science Monitor, are two of the ones that have taken the most significant steps to do different things, when faced with disruption. Benton: Well, Clay, James, and David, thank you all so much for taking some time this morning. I really appreciate it. Christensen: We’re honored that you’re interested. Clay Christensen photo by Betsy Weber used under a Creative Commons license. POSTED Oct. 18, 2012, 10:47 a.m.
Benton, Joshua. 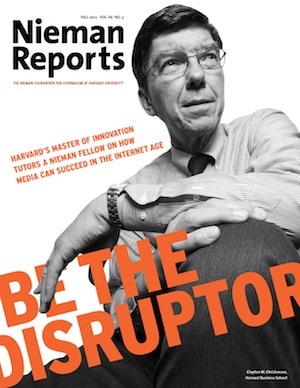 "Clay Christensen on the news industry: “We didn’t quite understand…how quickly things fall off the cliff”." Nieman Journalism Lab. Nieman Foundation for Journalism at Harvard, 18 Oct. 2012. Web. 19 Apr. 2019. Benton, Joshua. "Clay Christensen on the news industry: “We didn’t quite understand…how quickly things fall off the cliff”." Nieman Journalism Lab. Last modified October 18, 2012. Accessed April 19, 2019. https://www.niemanlab.org/2012/10/clay-christensen-on-the-news-industry-we-didnt-quite-understand-how-quickly-things-fall-off-the-cliff/.